April 2015. 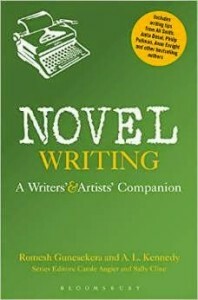 Chapter from Novel Writing – A Writers’ & Artists’ Companion by Romesh Gunasekera and A.L. Kennedy, Bloomsbury. We’re all amplified authors now, sharing our words naturally, with friends and then a widening circle of readers via social media, blogging, self publishing and possibly via a traditional publisher, but we don’t need a publisher in the way we once did. What’s vital is to seek out a community of trusted advisors to help us decide when work is ‘cooked’ enough to share and how best to package up and sell what we’ve written. I’d like to see libraries as the natural hub for such a community, but they’re not that now. Paper stuck together at the edges with glue will survive I’m sure, but for some time already it’s the content stored digitally that is the core version of the work, whether it’s then printed and bound or downloaded or simply read on a website. My book loving friends once swore blind they’d never read on screen and now enthuse about their kindles and iPads, so I think more will be read that way, but those that do get printed will be beautiful, tactile, making full use of print technology. For the past five hundred years, humans have used print — the book and its various page-based cousins — to move ideas across time and space. Radio, cinema and television emerged in the last century and now, with the advent of computers, we are combining media to forge new forms of expression. For now, we use the word “book” broadly, even metaphorically, to talk about what has come before — and what might come next. The ambition to put into the public domain all the texts which previously vanished into invisible out-of-printness takes my breath away, but the ethics of how that’s done are questionable. We need to ensure that search engines are guiding us to knowledge, not signposts pointing where the advertisers want us to go. Isn’t it preferable to let the story you want to tell define the length, shape, form and distribution method that seems most appropriate for it? It’s interesting that the web has spawned a lot of short form writing like Flash Fiction whereas TV’s moved towards epic narratives like The Wire, The Killing, Breaking Bad. It seems our attention span can be stretched or tightened any which way. I’m currently working on a novel which includes a narrative, songs, reader contributions, collaborations and live events. MORE doesn’t need to be a longer and longer story; it could involve spin-off stories for a community of readers hooked by the core text; it could be work in other media. If that makes your head ache, don’t panic. The whole point is that writers and readers can choose what they want from the growing menu of possibilities. In the olden days readers only had the blurb on the back of the book to go on. I’ve heard it said that self published Kindle authors agonise over the first few sampler pages which hook readers into buying, but they won’t get repeat downloads if they don’t keep hold of our attention after that. There’s still a hunger for big stories – when they’re worth it. Physicality: Tell me about the physicality of digital books. One of the pleasures of the paper book is that if you love it, the touch, the feel, the smell and the look all contribute to your enjoyment and memory of it. If you don’t like the book — for the words in it, the emotions in it, the smell of the paper — you can slam it down or chuck it away. Physical satisfaction either way. But you can’t fling your expensive electronic device quite the same way. You can certainly have the positive feelings about it but it is not so easy to express the negative. But is there an alternative way of expressing this physical relationship with things of the mind, other then pressing the delete button really hard? Ok, so the money is the big issue. But it’s not insurmountable. At one it was widely held that everything online was always going to be free, but now we’re getting back into the habit of buying chunks of digital stuff from app stores etc. I fancy making a search engine that operates like the worst small local libraries of yore: closed on Wednesdays with a limited range of titles and a grouchy librarian looking sniffy if you asked for something s/he felt was inappropriate. I hate being told what I’d like by some algorithm, but they do seem to be getting better at it. We ran a pop up Unlibrary within Hornsey Library for a year. It was a room with wi-fi, tables and chairs, shelves on which users could put information about themselves and create little assemblages based on their interests, with an email or twitter address displayed so others could contact them. We ran a weekly drop in and helped launch a philosophy learning circle and a songwriting group which still thrive. So here was a place where local readers and writers could make themselves known, seek collaborators, and meet together to think and create. Why ‘un’? Because it’s a library turned inside out – the people and their interests are the resource, given space to mingle as much as they wish. Out of that grew the idea of the Nearlyversity: informal tutorial groups devising their own courses using free resources from the web and meeting in cafes to discuss and help keep each other on track. But let’s not get complacent about it – there’s so much smug, nostalgic twaddle spoken about the power of books, as if music, film, games and multimedia can’t be mindblowing too. Yes you need a basic website now, at least as a digital equivalent of a business card. Beyond that it’s up to you to decide whether you want to publish and/or sell your work there, encoyrage lots of interaction with your readers or none whatsoever. Go to www.theliteraryplatform.com and www.thewritingplatform as well aswww.ifbook.co.uk for good stuff on digital writing and links to much more. In this age we know that students need to be able to communicate fast and informally yet with wit and precision, need skills in composing essays and stories using all the tools at their disposal on the laptop, tablet, mobile and whatever’s next: making and mixing sounds, movies and still pictures; creating spaces for reader interaction into stories and essays; using social media to spread their words. Students need training in and evaluation of their ability to read and write across media and digital platforms. This is about more than Powerpoint – it’s the appreciation and creation of literature set free from the printed page. In exploring our literary heritage and the history of the culture from which it grew, students need to be inspired by the potential for new forms of literature, poetry and storytelling created for the devices we use to access ideas now. Today we are all Amplified Authors, able to build a pool of readers around our words using a continuum of communication tools from email, facebook, twitter and other social media to blogs and self publishing platforms. The expression, much used by teachers of old in relation to the telly was, “You can always switch it off”, which implied that not watching TV was always morally best. But switching off our phone cuts us off from best and worst, the subject as well as the distraction. However, the concept of the flipped classroom takes the focus off the devices schools have on the premises, and demands that teachers have a clear and current awareness of how digital media is transforming how students learn and experience the world. 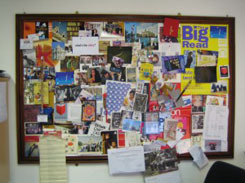 If necessary you can write a blog on paper, recreate the structure of a social network with cards pinned to a wall, explain the best means to search for information and teach an awareness of how coding works using a chalk board. There may be benefits to switching off the devices as long as we keep talking about how they work to connect us and our ideas, and discuss how we spot the qualities of texts and relationships when they come to us without the reassuring wrappings which tell us what is or isn’t deemed valuable. Above all students need the ability to bring a depth and quality of attention to words that matter. Now young people can read literature of all kind on the same device they use to write letters, watch TV and even make phone calls, they need critical faculties of steel to help them root out the best words and focus on them wholeheartedly. Neuroscientist Jonah Lehrer, author of Imagine: How Creativity Works, identifies ‘grit and persistence’ as the key attribute that leads to creativity. But I haven’t actually read his book, just heard the RSA podcast and googled his blog. Browsing with discernment and intention matters too. Surfing is such a descriptive word for how we use the web. Young people need a curriculum to help them stay upright and balanced on their journey across the swelling ocean of information, powered by its force, alert to its currents, its dangers and beautiful possibilities, riding it to where they want to go. Unlike most literary prizes, the New Media Writing Prize 2012 – now in its third year and awarded last week – features works that can be seen immediately and for free by anyone who clicks on the links (as long as they have the right software installed on their devices of course, digital culture still being prone to glitchiness). So please read on, but also click through to see the actual stuff itself. And the winner is… Katharine Norman, with a beautiful meditation made by a composer with a love of coding and an imagination that naturally expresses itself in digital, multimedia productions – sadly not yet viewable on the iPad. The term “poetic” in this field can be code for impenetrable, but this really is a multimedia poem of depth and substance, inspired by the work of John Cage. The viewer/listener/reader looks out of a window, hears ambient sound, evocative text, using a slider which makes it possible and pleasurable to move from day to night, to remix the balance of text to sound. Panellists in a debate before the announcement at Bournemouh University came from the three worlds rapidly converging around an interest in this kind of work. Sarah Butler is a writer with a track record of collaborative projects – and now a novel to be published in January by Picador and in 14 countries. Louise Rice works at TouchPress making amazing literary apps, some of which generate serious money. Andy Campbell runswww.dreamingmethods, and has been mingling web and text in amazing ways for decades, with little finance but much critical praise. All agreed it’s the time for creative minds to focus their energies on making fabulous work using whichever blend of the current means available seem most inspiring and appropriate to the stories they want to tell. Then business people really will have something worth building a marketing plan around. And that may be a crass generalization, but now that we can find stories on mobiles as well as on pages, we realise that a book isn’t an object at all but an experience. Meanwhile the mainstream literary community has been so fixated on defending paper books, they’ve failed to find other ways to define what they most want to preserve about our literary culture…. In the digital age the book can no longer be defined as a stack of paper glued together at the side—it’s a unit of culture, a container of ideas that requires a certain kind of attention from its consumer. Reading on iPods and e-readers reminds us that however we receive it, fiction happens in our imaginations, the book is a souvenir of that experience.